I have directed that this farewell message shall not be published in the form of any routine official military document. It is my desire that it be considered as a personal letter from me to every officer, warrant officer, and enlisted man. Orders have been received assigning me to a new duty. I must depart immediately. I have never appreciated any other military assignment so much us I appreciate the opportunity that I have had to serve with you. I have never so thoroughly enjoyed any other service. I feel that with you I have rendered to my Country the most important and the most effective service of my career as an officer. Feelings of loneliness and sadness fill my soul as I leave you. I met you first near the end of those bitter cold and hard fought days in the Ardennes. You had come through that vicious introduction to war with great credit to yourselves. Since then you have constantly improved your skill in the art of war. You have learned to win more readily and at lower costs. Your confidence and morale have soared to heights rarely attained. In the Colmar Pocket, where you saw war in its ugliest aspects, you performed excellently under the French First Army. Operating with two veteran American and two veteran French divisions, you contributed your full share to that complete victory. On the Maas River under the British Second Army you established an unpenetrated wall against every hostile threat and you mastered the difficult technique of reconnaissance across a formidable stream. Moving to the U.S. Ninth Army, you mopped up the Roer-Maas triangle. Your next assignment was to screen the assembly of the XVI Corps for its crossing of the Rhine River and to collect the information of the enemy and the terrain on which the detailed plans for the crossing were based. You achieved unparalleled success in the accomplishment of those missions. Crossing the Rhine you attacked successfully for fourteen successive days against the determined resistance of four German divisions, two of them being among the enemy's best remaining divisions. You destroyed the bulk of the hostile forces north of the Ruhr River. ou drove the remnants across the river with such swift and skillful maneuvers and with such powerful and relentless attacks that you were able to secure intact certain of the all-important Ruhr bridges. With the threat that you had set up on his north flank, the enemy south of the river threw down his arms and surrendered the largest number of men ever captured in a single operation. armies as well as by our American high commanders. That you constitute one of the best divisions ever to have served our Country is attested to by the mass of commendations received from those senior commanders and by unsolicited high praise from officers and enlisted men of many units that have served side by side with you. Proud as I am of your achievements in combat and of your success in handling the problems incident to the occupation of a conquered territory, I am equally proud of your exemplary personal characteristics. In your high intelligence, in your clean living, in your good behavior, in your cheerful acceptance of dangers and hardships, in your friendly attitude and your thoughtful consideration of others, in your loyalty to each other and to your leaders, and in your high standard of discipline you excel any equal number of young men I have ever known. Regardless of where we may be called to serve during the remainder of this war, each and every one of us will be 75th Infantry Division men as long as we live. I am exceedingly anxious that at an early date you will initiate the organization of a division association through which we may meet and renew old acquaintances during the years to come. I leave you knowing that neither as a division nor as individuals, neither in war nor in peace will you ever accept failure or be content with mediocre performance of your tasks. I shall follow with pride and pleasure your future achievements in this war and the active leadership which I confidently expect you to assume in civilian life when you have returned to your homes. I shall always be glad to hear from any of you and I do hope that none of you will ever fail to visit me when you are in a position to do so. Happy memories of our months together will brighten the remaining days of my life. With my most fervent wishes for your future successes and happiness, I bid you, good-bye! Ideally, a new division's introduction to combat should be a relatively easy one, but Field Marshal Gerd von Rundstedt's December offensive in the Ardennes presented such a threat to the Allied cause that the 75th Infantry Division was obliged to start combat with the toughest fight encountered in the whole war in the west. During its month in The Bulge — the first half on the defensive, the second half on the offensive — the 75th Infantry Division won its spurs by helping to smash the German advance and by retaking the ground that had been lost. The rookie division had become seasoned in a battle described by Prime Minister Churchill on 19 January 1945 as one that would live forever as a famous American victory. The Ardennes mountains extended over broken terrain characterized by deep ravines, narrow valleys, and steep hills, with numerous intervening small streams and cross compartments. Much of the area is heavily forested, largely with fir trees. Blinding snow storms, with subsequent drifting, added to the terrain difficulties. Snow drifts often filled ravines so as to make them unnoticeable until men and equipment disappeared from sight. The snow hampered movement, and enabled personnel and equipment to be easily spotted, especially at night. Mine fields laid in the snow were difficult to detect. While a few good roads existed along the routes through the larger towns, most often difficult secondary roads had to be used. During the first phase, 24 December - 14 January, some of the Division's major elements were attached elsewhere, in piecemeal fashion in order to stem the Nazi break through toward LIEGE, BRUSSELS, and ANTWERP. During the second phase, 15 - 24 January, the 75th Infantry Division took part in the XVIII Airborne Corps' coordinated attack to retake ST. VITH and its vital road net. The Division's role in the battle — to cross the SALM River to capture VIELSALM was a classic example of the double envelopment. The 291st Infantry on the north attacked and seized the high ground north of the city; the 289th Infantry attacked and seized the high ground south of the city. Thus the whole valley became untenable for the enemy, and he withdrew. A patrol from the 2d Battalion, 291st Infantry, discovered the withdrawal, and Corps was requested to block the upper end of the valley with troops in the vicinity. Determined resistance by the enemy held the corridor open, and the withdrawal continued under fire. The Germans then began a series of delaying actions which characterized the rest of the battle. The division's achievements were measured in ground held and ground gained rather than in striking enemy losses. Nevertheless, 1142 prisoners of war had passed through the division's cage by 24 January, and six tanks and much other materiel were destroyed. Our own losses were heavy. During the period 24 December - 24 January, the Division suffered 407 killed, 1707 wounded, and 334 missing. The intense cold proved as serious an antagonist as the enemy. Non-battle casualties, largely trench foot, frostbite, and cold injury accounted for 2623 casualties. The men were not fully prepared for severe winter warfare. Shoe packs had not yet arrived and the available overshoes frequently filled with snow. Gloves were not in adequate supply. Because of the constant fighting, wet clothing was difficult to replace. overcome all obstacles and won a splendid victory. I congratulate you on your achievement. . .
sure that its history will be enriched with victory. New York on 22 October, landing in England on 3 November. Division artillery embarked on 15 November, landing on 22 November. Training and assembly of equipment highlighted the division's stay in the United Kingdom The move across the Channel in LSTs took place 10 December. Meanwhile, an advance detachment from division, Division Artillery, Regimental Headquarters had joined the 29th Infantry Division, near JULICH, GERMANY, for a fortnight's study of staff procedures under actual combat conditions. From YVETOT, near LE HAVRE, the division entrained for WILJRE - NETHERLANDS, a destination subsequently changed to TONGRES, BELGIUM. The infantry made this 250 mile trip in the traditional Hommes 40 Chevaux 8 box cars, while the motorized elements traveled by road. The Ninth United States Army, to which the division had been attached, had planned an operation for the division in the GEILENKIRCHEN sector in Germany. But the German breakthrough in BELGIUM necessitated the attachment of the division to VII Corps of the First United States Army. By 2400 on 22 December, the division Command Post had opened and the units assembled at OCQUIER, BELGIUM. The German counteroffensive was advancing rapidly. By 24 December the salient, bypassing BASTOGNE, had thrust toward MARCHE with an estimated strength of two armies - the 5th and 6th Panzer. The 5th Panzer Army whose Artillery Commander, Lieutenant General Metz, was captured by the 75th Infantry Division in WESTPHALIA in April 1945 consisted of the 5th Panzer and the 5th Infantry Divisions. On 24 December tank-infantry attacks by the 116th Panzer Division were being made in the vicinity of HOTTON and SOY. The German threat demanded immediate action. There was insufficient time for the division to execute essential reconnaissance and move forward as a unit; consequently, the VII Corps Commander on 23 and 24 December attached Combat Team 290 and Combat Team 289 to the 3d Armored Division. The remaining tactical elements of the division outposted along L'OURTHE River between BOMAL and GRANDMENIL. BELGIUM, as VII Corps reserve. Combat Team 290 initially met little resistance. It cleared the HOTTON — SOY road of the enemy, pushed south, and by 2400 on 25 December had reached its objective (The line: BLIER — HAMPTEAU). The heaviest resistance was met in the advance toward HAMPTEAU. Near the village of WERPIN, the enemy was entrenched on a high hill which controlled the HOTTON — HAMPTEAU road. It was necessary to cross an open field 300 yards wide in order to reach this objective. Company K made a frontal attack, but was pinned down by enemy machine gun fire with great loss. Then, supported by supplemental flank attacks by Companies I and L, Company K attacked again and drove the enemy from his position. This ended the threat to HOTTON and marked the high water mark of the German drive northward toward LIEGE. Many acts of heroism were performed by the officers and men of Companies K, I, and L in taking this hill. The 289th Infantry was attached to Combat Command B of the 3d Armored Division, and was given the mission of seizing, organizing, and defending a frontage of approximately 10,000 yards in the very heavily wooded area running south and east from GRANDMENIL to EREZEE. The regiment was ordered to attack at 0800 on 25 December, with battalions abreast. While dismounting from trucks in the assembly area on the eastern flank of the regiment, the 3d Battalion was hit by German tanks which had succeeded in breaking through elements of the 3d and 7th Armored Divisions east of GRANDMENIL. A bazooka man from Company K scored a hit on a German tank and stopped this attack. The three battalions advanced against light opposition, but due to wide frontages and thick woods were unable to establish contact during the night of December 25-26. Early in the evening the 3d Battalion received orders to be prepared to assist elements of the 3d Armored Division in the capture of GRANDMENIL. On the morning of 26 December the entire battalion was detached from the regiment and attached to Combat Command B for the attack on GRANDMENIL, which it spearheaded. By late afternoon of 26 December, the town had been taken. The battalion, after reverting to regimental control, defended GRANDMENIL. During this period (27 December - 1 January) all operations except those of Division Special Troops were outside division control. On 27 December the division was attached to XVIII Airborne Corps, and the command post moved to VILLIERS ST. GERTRUDE, BELGIUM. Combat Teams 289 and 290 remained attached to the 3d Armored Division, but all other division units moved to the new assembly area. The 2d Battalion, 291st Infantry, released from the 2d Armored Division, moved to the new area on 28 December, and dug in on the hills south of VILLERS ST. GERTRUDE where they remained until 29 December. During the evening of 27 December the 1st Battalion, 289th Infantry was attacked on its left flank by elements of a Volks Grenadier regiment, which made a slight penetration. A counter attack restored the original position. As the 1st Battalion was extending its line to the west shortly after midnight to gain contact with the 2d Battalion, elements of the 25th and 26th Panzer Regiments of the 12th Panzer Division filtered between the two battalions and penetrated to SADZOT before strong counter attacks stopped them. on 1 January The 289th Infantry reverted to division control on 29 December. Combat Team 290 remained on the defense, attached to 3d Armored Division. and continued during the night. to pull the Sixth Panzer Army out of The Bulge, the opportunity to annihilate it must be seized. Accordingly, the VII Corps was to jump off at 0830 on 3 January and seize the area HOUFFALIZE — BORIGNY. The 2d Armored Division was to spearhead the attack, supported by 3d Armored. 84th Infantry, and 83rd Infantry Divisions. The 84th Infantry Division, with Combat Team 290 attached, was ordered to attack in support of the 2d Armored Division to protect the right flank of the Corps and block all enemy movement across L'OURTHE River. The remainder of the 75th Infantry Division was ordered to secure its front lines and assist by fire the initial attack of the 2d and 3d Armored Divisions. After our lines were passed, the division was ordered to be prepared to assemble in reserve. The 289th Infantry prepared for the attack by removing anti-tank and anti-personnel mines in its sector. At. 1300 on 3 January, Company F of the 289th Infantry attacked dug-in enemy positions south of VEIUX-FORNEAUX. One enemy pocket was wiped out by grenades, but strong automatic weapons fire stopped the advance, and the company fell back to dug-in positions. Company G, 112th Infantry (attached) attacked at the same time to envelop the east flank of the enemy, but was stopped by heavy mortar and machine gun fire. The remainder of the 289th Infantry screened the advance of the 2d Armored Division by defensive action. The 290th Infantry, attached to the 84th Infantry Division, cleared mine fields and roadblocks, and supported the attack with fire. The 291st Infantry screened the advance of the 3d Armored and S3d Infantry Divisions by holding its line at MANHAY. By 1150 on 3 January the battle had passed beyond the view of the 291st Infantry, although the regiment was still subjected to harassing mortar fire. On 4 January most of the division-controlled units were out of contact with the enemy. During the day the 83d and 84th Infantry Divisions passed through the 75th Infantry Division sector and continued to attack south. Some resistance from bypassed German units continued in the sector of the 289th Infantry south of VEIUX-FORNEAUX. The 289th Infantry, with one company of the 750th Tank Battalion one battery of the 440th Anti Aircraft Artillery (Automatic Weapons) Battalion, a company pf the 772d Tank Destroyer Battalion and the 2d Battalion of the 112th Infantry with 6 medium tanks, all attached, attacked German positions from the northwest. By 1130 the hostile positions were overrun, but mopping up of the sector continued throughout the afternoon. Enemy losses were two prisoners and fifty dead. The 3d Battalion of the 289th Infantry. previously in the vicinity of GRANDMENIL, relieved the 2d Battalion, 112th Infantry, in the sector by 1730. The 289th Infantry, with the 897th Field Artillery Battalion in direct support, continued to defend the sector GRANDMENIL-AMONINES down to the AISNE River on its southwest flank. assigned mission of patrolling to the front and making contact with 335th Infantry at BEFFE. DEVANTAVE; Company B arrived and occupied the ground west of BEFEE to L'OURTHE River. The remainder of the 1st and 2d Battalions continued to maintain contact with the enemy and to determine his strength. The 290th Infantry was relieved from positions along the AISNE River on 7 January, and closed in the division assembly area at 2400. By this time all units under division control had closed in this area, except the 730th Field Artillery Battalion, which was unable to negotiate the icy roads. The situation in the 290th Infantry's sector remained substantially the same during 7 January. The 2d Battalion was assembled in the woods east of MAGOSTER. The 3d Battalion remained on a defensive position in and around DEVANTAVE and supported elements of the 84th Infantry Division in their attack. The 1st Battalion continued its advance, crossing the line of departure at 1030, but moved only a few hundred yards before it was pinned down by enemy fire. Enemy resistance prevented the battalion from reaching its objective. On 8 January the Division was ordered to relieve the 82nd Airborne Division in the western sector of the XVIII Airborne Corps along the SALM River. That day the 82d Airborne Division attacked the enemy position from the west down the THIERS DEL PREUS - THIER DUMONT Ridges. This attack initially surprised the enemy; but he reacted stubbornly, employing infantry, tanks, and considerable artillery and nebelwerfer fire in a vain effort to hold his position in this sector. He retired slowly southwest, leaving pockets of resistance along the south bank of the SALM River opposite GRAND HALLEUX and from RENCHEUX to SALMCHATEAU. The enemy in this sector consisted of elements of the 2d Battalion, 753d Regiment, 326th Infantry Division. the previous day. 3d Battalion patrols tried to cut the LAROCHE-SAMREE road, but met strong enemy automatic weapons, mortar, and artillery fire, and were unable to complete the mission. Three enlisted men were killed and ninety-four wounded, sixteen prisoners from the 60th Panzer Regiment and 62d Engineer Battalion were captured. On 10 January neither the division nor the 82d Airborne Division were in firm contact with the enemy. The 82d Airborne Division continued to receive scattered artillery fire from the vicinity of SALMCHATEAU and VIELSALM. By 2400 the division had, with minor exceptions, relieved the 82d Airborne Division. On the same day Combat Team 290 was relieved from attachment to the 84th Infantry Division and was enroute to the assembly area near the division command post at HAUTE BODEUX. It closed in its assembly area at 0300 on 11 January, and was held in division reserve. During the period 12 - 14 January the situation remained relatively static. The division strengthened its positions along the SALM River, continued its patrols to the east, and improved the bridgehead across the SALM River previously established by the 517th Parachute Infantry Regiment in the vicinity of GRAND HALLEUX. At 1300 on 12 January Company L of the 291st Infantry successfully attacked the high ground west of ENNAL, but at 1700 received a counter attack that drove two squads off their objective. These heights were regained 13 January. At this time the area south of the objective was reconnoitered and found to be untenable. A lone enemy plane bombed and strafed a mess building at the division command post at approximately 1930 on 14 January, the 730th Field Artillery command post at 1930, and the 899th Field Artillery command post at 1915. At the division command post Lieutenant Colonel Ralph L. Lowther, Division Signal Officer, and four enlisted men were killed. One officer and ten enlisted men were wounded. Thus far the division had been contributing most of its strength to other divisions in the Allied effort to stem the breakthrough into Belgium. Now together for the first time, the 75th Infantry Division was ready for offensive operations. At1914 on 14 January, the Division Commander called the Chief of Staff. Colonel H. B. Powell, from the XVIII Airborne Corps command post and issued the order: The division attacks tomorrow, 15 January 1945. Hour of attack — 289th Infantry, 0300; 291st Infantry, 0800. Field Order Number 7, setting forth the plan of attack, was prepared by Lieutenant Colonel Robert C. Dean, Assistant Chief of Staff, G-3, that evening. east bank of the SALM River. In the vicinity of the village of HOURT he was entrenched heavily, with numerous bunkers built from timber, covered with earth, and camouflaged with snow. Each bunker contained three to four men with automatic weapons. Stone buildings and cellars were being effectively used in the towns of VIELSALM, SALMCHATEAU, and BECH. VIELSALM itself was situated in a terrain corridor flank on either side by high ground. The concentration of enemy strength suggested the division plan of attack: a double envelopment of VIELSALM from north and south. The enemy forces in this sector consisted of elements of three regiments of the 326th Volks Grenadier Division, plus remnants of the 62d Volks Grenadier Division. On 14 January our forces were generally along the west bank of the SALM River except in the vicinity of GRAND HALLEUX on the north where the 517th Parachute Infantry Regiment, while attached to the 82d Airborne Division, had effected a bridgehead into that town. The division sector extended from LA NEUVILLE on the east bank of the SALM River in the north, down to the vicinity of PROVEDROUX, on the west bank of SALM, in the south. The 291st Infantry occupied the northern sector from LA NEUVILLE to a point south of PROVEDROUX. The 290th Infantry was held in division reserve; the 3d Battalion in northern sector, the 1st Battalion in the southern, sector, and the2d Battalion in the rear at BASSE BODEUX. The 3d Armored Division and the 83d Infantry Division were attacking to the southeast on the 75th Infantry Division's right flank. The 106th Infantry Division (less two Regimental Combat Teams), which had jumped off on an attack to the south on 13 January 1945, continued its attack in the zone between the SALM River and the 30th Infantry Division. The 75th Infantry Division's attack smashed across the SALM River as scheduled on 15 January under cover of darkness and the important towns of BECH and SALMCHATEAU were seized. The 2d Battalion, 289th Infantry began crossing the river at 0340 at a point just north of PROVEDROUX, and by 0614 all elements of the battalion were across. The battalion, after by-passing SALMCHATEAU, swung north toward BECH supported by heavy artillery fire, and at 0850 Company E was at the edge of the town of BECH. Companies F and G, overcoming fanatical resistance, pushed into the town, and by 1500 the 2d Battalion was in complete control of BECH. In this engagement the 2d Battalion lost approximately fifty men killed and wounded, and captured approximately eighty prisoners. Upon completion of this operation, F Company swung northwest toward SALMCHATEAU to assist the 3d Battalion in capturing that town. of this mission, the battalion made a diverting feint between SALMCHATEAU and a point about 2000 yards north of VIELSALM, continuing the feint until daylight. a wire fence which at that moment was cut by an enemy machine gun burst. He went through the opening in the fence, reached his command post, and returned with needed assistance. For this heroic action he was awarded the Silver Star Medal. The 3d Battalion remained in position in the vicinity of GRAND HALLEUX, protecting the rear of the regiment, but at the same time it gained contact with the 424th Infantry, 106th Infantry Division, to the north as the latter regiment took ENNAL. On the second day of the attack, 16 January, the enemy continued to resist the 75th Infantry Division's advance with varying degrees of intensity The 291st and the 289th Infantry Regiments continued the attack, knocking out one enemy tank and capturing approximately 110 prisoners. During this time the engineers completed the Bailey bridge across the river at SALMCHATEAU. The 290th Infantry remained in division reserve, with the exception of the 1st Battalion, which continued to hold and defend the sector along the SALM River west of VIELSALM. The Division Artillery fired a ten minute preparation in support of the attack of the 291st Infantry, and thereafter, throughout the day gave continuous support to the division attack, firing a total of 1,887 rounds for that period. following message to the Division Commander: "I understand that you are having an extremely favorable condition in your sector. I want that situation exploited to the limit of physical capacity. Push out small groups with automatic weapons fire. Secondly, block passage to the south. This is an opportunity for your division to make a name for itself. Keep me informed." The division pushed on. The 289th Infantry improved its previous position and then moved on north and south from BECH. The 2d Battalion, advanced north from BECH at 0400 and cleared the ridge southeast of NEUVILLE. The 3d Battalion moved southeast of BECH to positions in the vicinity of the westerly edge of GRAND BOIS (forest) about 2000 yards north of ROGERY. C was pinned down by small arms fire, Capt. Bogardus maneuvered the platoon into position, returned the fire, and neutralized the enemy power. For this action Captain Bogardus was awarded the Silver Star. The Division Commander committed the 290th Infantry, which had previously been in division reserve. The 1st Battalion moved into and occupied the town of VIELSALM at 1400, and after being passed through by the 3d Battalion, moved northeast to take VILLE DU BOIS and PETITE-THIER. From there it continued northeast and east to the crossroads at PATTEAUX. At the close of the period, the battalion had started sweeping the woods to the southwest. The 3d Battalion, passing through VIELSALM, occupied NEUVILLE at 1710. At that point it reorganized and continued the attack to BURTONVILLE, where it was in position at the close of the period. The Engineers in the interim constructed a 50-foot Bailey bridge at VIELSALM. BURTONVILLE, but heavy small arms, machine gun, and mortar fire on the high ground east and southeast of the town made the town untenable. The 291st Infantry established perimeter defenses around VILLE DU BOIS and PETTITE-THIER, and maintained the road block in the vicinity of PATTEAUX against heavy mortar and artillery fire. The 2d Battalion, 291st Infantry, which had relieved the 2d Battalion, 290th Infantry, at the road block in PATTEAUX was relieved by the 3d Battalion, 517th Parachute Infantry, at 2000. In the course of relieving the 2d Battalion, 290th Infantry, the 2d Battalion, 291st Infantry, encountered a murderous artillery and mortar barrage at the crossroads. Rifle and machine gun fire was also very heavy, and soon direct fire from enemy tanks was being placed on the crossroads. A direct hit upon one of our tank destroyers started a fire which ignited ammunition near the battalion aid station, further endangering battalion troops. 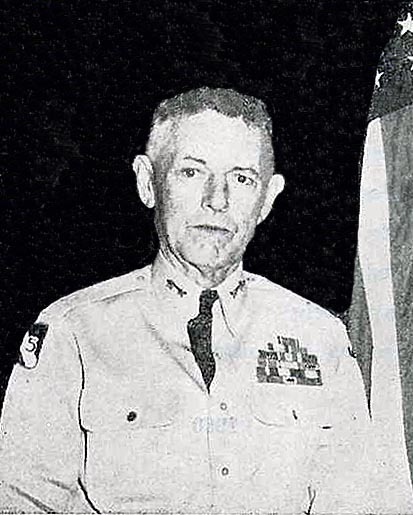 Lieutenant Colonel Jesse C. Drain, Jr., Battalion Commander, personally supervised the removal of the vehicle, and then assisted the aid men in removing the wounded to a place of safety. For this heroic action Lieutenant Colonel Drain was awarded the Silver Star Medal. One enemy tank was destroyed by the division in the area south of PATTEAUX, and 144 prisoners captured, bringing the total for the four day offensive to 733. The morale of the prisoners in most cases was extremely low. They complained bitterly of the lack of food and the general inadequacy of supplies. Prisoners of war of the Volks Grenadier units complained that the SS units were always withdrawing when danger was imminent. All prisoners of war talked freely, and the Division G-2, Lieutenant Colonel George C. Dewey, was therefore able to establish an accurate picture of the order of battle, morale, strength, equipment, and supply difficulties. The village of Vielsalm was heavily mined when the enemy withdrew. Fortunately, a prisoner captured by Company C of the 290th Infantry had an accurate map of the mines and booby traps. On checking, the Division Engineer found the information on the maps remarkable accurate, and turned them over to the second and third platoons of Company C, 275th Engineers, led by Lieutenant Frank J. Streno and Lieutenant L. B. Johnson, respectively. On their way to the minefield, they stopped to pick up a prisoner from the Prisoner of War cage who had helped to lay the mines, and who cheerfully agreed to help neutralize the menace. With this aid, the work was completed quickly and without casualties. In addition, the second platoon had the satisfaction of discovering a new type of mine in the enemy installation. On 19 January the enemy was fighting from well constructed entrenchments in islands of resistance throughout the GRAND BOIS, a heavily wooded sector of the famous ARDENNES forest. Intermittent snows kept the ground covered knee deep. The enemy was camouflaged by white capes, while our soldiers were dressed in ordinary OD uniforms. 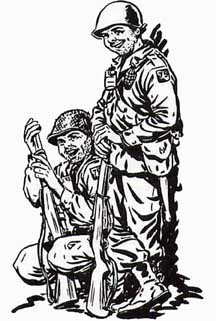 Prisoners of war stated that our soldiers were visible from a distance and easy to hit. continued to advance up to its new objective throughout the day, meeting stub- born enemy resistance consisting of small arms, artillery, and mortar fire in the 3d Battalion area. The 2d Battalion cleared the woods northeast of THIER DES CARRIERS, then attacked south against heavy resistance, reaching their objective south of THIER DES CARRIERS. Upon being relieved by the 1st Battalion moved by motor to RENCHEUX, BELGIUM, for rest and reorganization, and was joined there by the remainder of the regiment the following day. The American Red Cross opened a small lounge in town, and with the aid of civilian girls supplied hot coffee and doughnuts, writing paper, radios and a phonograph. The principal activity for this period occurred in the 290th Infantry sector east of BURTONVILLE. During the previous night. Companies I and L dug in, in anticipation of a planned attack by our forces the next morning. During the night camouflaged enemy snipers took up positions in the woods. In the morning, as our units prepared to attack, the snipers opened fire from all directions. At the same time, approximately 60 - 70 enemy infantry and tanks attacked. Three companies were forced to withdraw approximately 1000 yards before they reorganized, counter-attacked, and drove the enemy out. GRAND BOIS. He offered slight resistance to the 290th Infantry south of that sector, and in the early morning of 21 January he completely broke contact with our assaulting regiments. Patrols were sent out to reestablish contact. Meanwhile, the 291st Infantry replaced the remaining elements of the 289th Infantry, all of which reassembled in the RENCHEUX area, where reorganization and rehabilitation continued. With the 290th and 291st in the front line, plans were then formulated for further offensive action. The division started a new attack the morning of 22 January. The 30th Infantry Division on our left flank, and the 84th Infantry Division on our right, were attacking south and southeast. The 290th Infantry attacking at 0800, overcame strong enemy resistance. Elements of the 750th Tank Battalion (attached) knocked out several machine gun nests. The 2d Battalion encountered heavy automatic weapons and mortar fire in the woods west of KAPELLE, which prevented further advance. Company C, 750th Tank Battalion.